Before the trip I did some research and found a place just east of Gunnison, Colorado for viewing Gunnsion Sage-Grouse. The birds display in a meadow that can be viewed from a pull-off on the side of a road. The pull-off is free and open to the public (though the meadow the birds use is on private property), and viewing them involves following the same protocol as viewing the Lesser Prairie-Chickens we missed in Kansas, except that you use your vehicle as a blind. Seems fairly easy and straightforward but after missing the Lesser Prairie-Chickens I was a bit apprehensive. We left Gunnsion early on the morning of April 17 and made our way to the Gunnison Sage-Grouse viewing area about 20 miles to the east. We arrived in the dark, parked, and waited. A car pulled up behind us a few minutes later. I thought it was another birder but it turned out to be a volunteer with Colorado Parks and Wildlife, whose job was to answer questions about the grouse and to make sure visiting birders follow the protocol for viewing the birds, i.e., staying in your vehicle, keeping quiet, and not leaving until the birds disperse. So we waited for the birds to appear and kept quiet. At first light we noticed some movement in the distance, perhaps 200 yards away and directly to the east of where we were parked. It was still fairly dark but we could tell that they were Sage-Grouse and they had started to display. I moved over to the passenger side seat of my car and Karen got in the back so we could each have a window to view the birds. Our bins just weren’t strong enough to see the birds well, so we took turns using Karen’s 30x Kowa telescope to get better looks at them. I don’t have a window mount so we rested the scope on the half opened windows for stability. Using the telescope made a world of difference and we could tell the birds were Gunnsion Sage-Grouse and not just Sage-Grouse. There were 8 birds, 4 males and 4 females. Most of the females were concentrating their attentions around one male, which is typical lekking grouse behavior. The displaying continued until about sunrise and then abruptly stopped and the birds remained motionless for the next 20 minutes or so. About a half an hour after sunrise the whole group got up and flew hard and fast to the west, over the road we were parked on and in front of us and disappeared into the sage covered hills on the other side of the road. Success and our first life bird of the trip. After seeing the grouse we started driving west through Colorado. On the map I noticed a large body of water just outside of Gunnison and right along our road called Blue Mesa Reservoir. I thought that any sizable body of water up here might have birds, and it did. There were lots of dabbling and diving ducks, including Green-winged and Cinnamon Teal, Gadwall, American Wigeon, Northern Shovelers, Lesser Scaup, Ring-necked Ducks, Redheads, and Common and Barrow’s Goldeneyes. We also had a few Western Grebes, a Common Loon, Franklin’s, Bonaparte’s, and Ring-billed Gulls, and our first of many Black-necked Stilts of the trip. 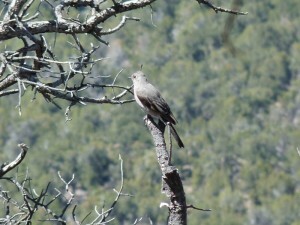 There were also singing Sage Thrashers around the road into the reservoir. Nice. Just west of Blue Mesa Reservoir is Black Canyon of the Gunnison National Park. When I was planning the trip I did some research and discovered that it had Dusky Grouse, or so I read, and I still needed Dusky Grouse. I didn’t think our chances of seeing them were very good but it was on our route and I thought it might be worth checking, so we did. And it was worth it. The spectacularity of this place can’t be described with words, and the photo below doesn’t do it justice. It has to be visited to be experienced. The sheer cliffs dropped maybe 2000 feet straight down to the Gunnison River below. I stood at the edge of an overlook and almost got dizzy. Definitely not a place for folks who are afraid of heights though. We didn’t see any Dusky Grouse but there were birds to be seen. White-throated Swifts zoomed by, sometimes below eye level. A Peregrine Falcon was working the canyon. Hiking the trails yielded a Golden Eagle, several Western Scrub-Jays, Townsend’s Solitaire, Mountain Chickadees, Red-breasted Nuthatches, a Bushtit (our only Bushtit of the trip), and a few other things. We didn’t see anything unexpected for this part of Colorado, but being from Chicago almost all of these birds were exciting. The scenery was worth the price of admission too. After Black Canyon we started heading west again. At Montrose we picked up 550 and began driving south towards New Mexico. The scenery was something to behold. I’ve been to Colorado before but not enough to get bored with looking at mountains. The stretch from Ouray to Silverton was especially dramatic, with snow covered peaks like you’d see in a travel brochure or commercial. I concluded that Colorado wasn’t cheated when it comes to scenic beauty. The birding was a little slow though, as would be expected for mid April in the high Rockies. Black-billed Magpies and Common Ravens were the most common birds, with a few Mountain Bluebirds and Says Phoebes thrown in for color. Near Ouray we drove up a Forest Service road for a couple miles just out of curiosity and had Mountain Chickadees, Red-breasted Nuthatches, a lone Clark’s Nutcracker, and a Pine Grosbeak. We had more Pine Grosbeaks near Silverton. This entry was posted in Non-Montrose Birding on June 30, 2014 by rhughes. The Curve-billed Thrasher was still at Montrose early this morning, June 29. I was near the north end of the Magic Hedge when I noticed Geoff Williamson looking at and then pointing to something. I assumed he had the thrasher and when I got closer I could see the bird perched near the top of a Jack Pine. The thrasher posed obligingly for a minute or 2 before flying about 50 yards to the east and disappearing into the underbrush. I didn’t follow it but I assume it’s still in the area. Geoff also alerted me to a Clay-colored Sparrow he heard singing near the Park Bait Shop while driving in. I went over to the area and after a little poking around found the Clay-colored in the group of small evergreens just across the road from the Park Bait Shop. 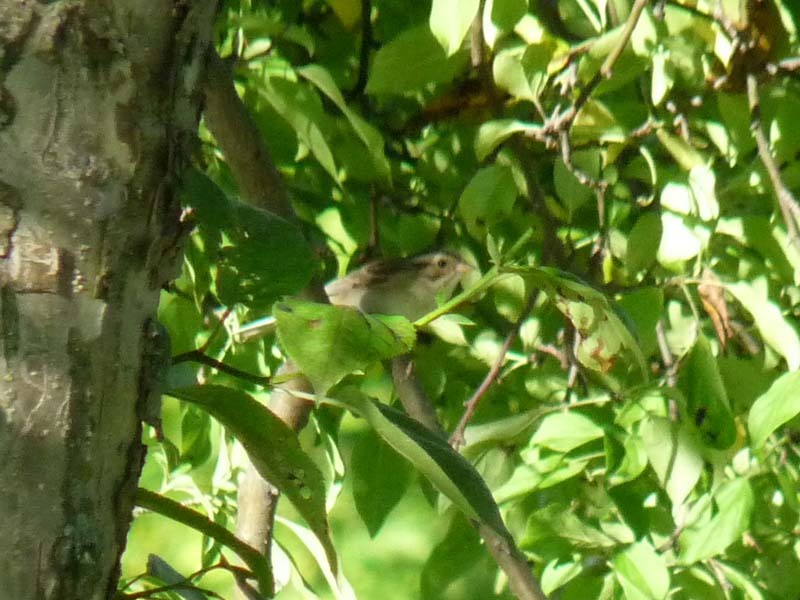 This is a very unusual sighting as Clay-colored Sparrows don’t normally occur at Montrose in late June. This entry was posted in Rare Birds, Summer Bird Reports and tagged Clay-colored Sparrow, Curve-billed Thrasher, Mimids, Sparrows on June 29, 2014 by rhughes. A female Red-breasted Merganser appears to be over summering at Montrose. She’s been seen near the fishhook pier and inside the boat harbor, where I saw and photographed her today. I also saw my first juvenile Northern Rough-winged Swallows of the season today. Northern Rough-winged Swallows nest on the fishhook pier and can often be seen hawking insects over the dunes. They, along with other swallows, like to perch on the yellow rope that cordons off the protected areas of the dunes. 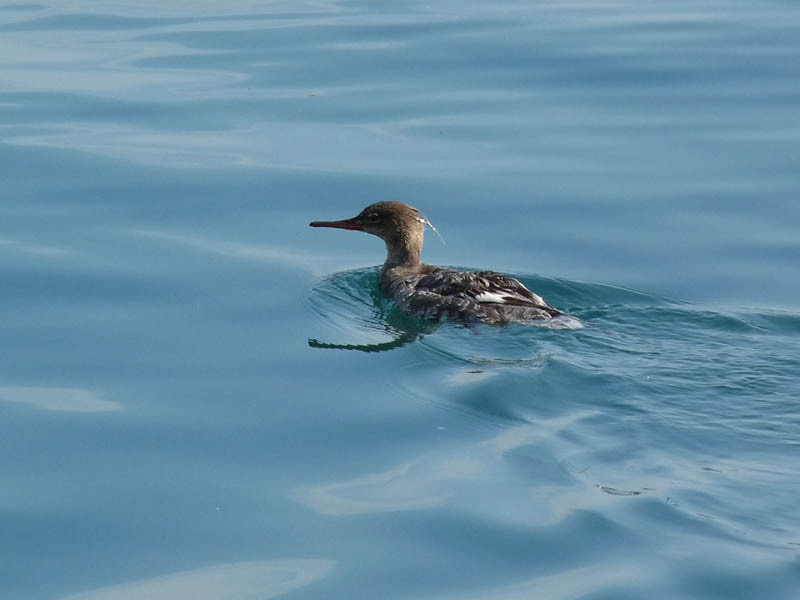 This entry was posted in Summer Bird Reports and tagged Red-breasted Merganser, Swallows, Waterfowl on June 24, 2014 by rhughes. 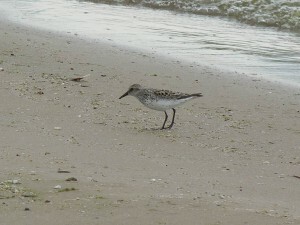 I saw a late (or early) Semipalmated Sandpiper on the beach inside the protected area this afternoon. We’re in a gray period for shorebird migration now and determining which way they’re going can be difficult. If I had to guess I’d say this bird is a very late northbound migrant, though if it showed up a week from now I’d lean more towards an early fall migrant. There was also a fledgling Spotted Sandpiper running around on the beach inside the protected area. 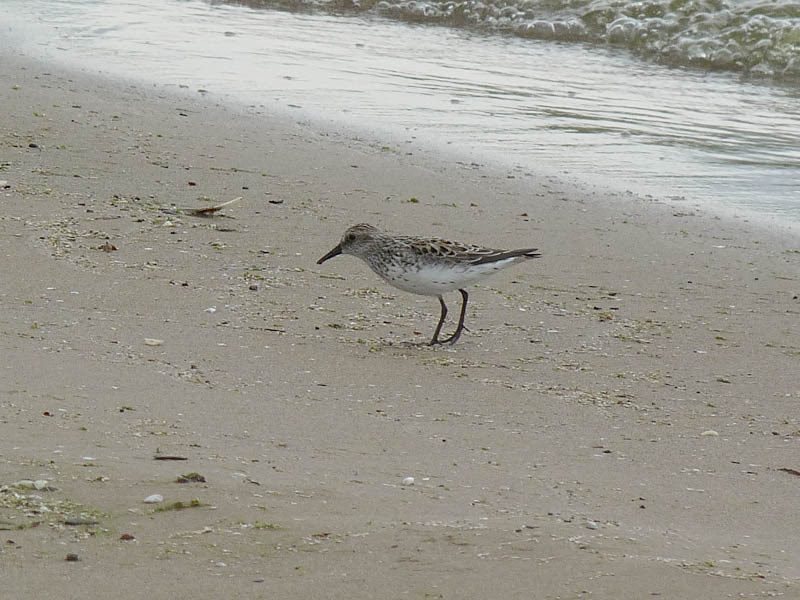 This entry was posted in Summer Bird Reports and tagged Semipalmated Sandpiper, Shorebirds on June 23, 2014 by rhughes. 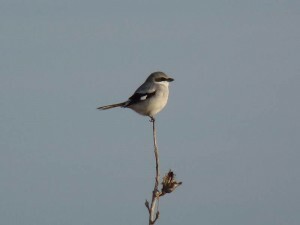 On April 15 I set out on a two week birding tour of the western and southwestern United States. Karen Mansfield was my traveling and birding partner for the first ten days of the trip. Karen was planning on hiking the Continental Divide Trail this spring and summer and I offered to drive her to Lordsburg, New Mexico. From there she would take a shuttle to the trailhead in New Mexico at the Mexican border to start her hike. The Continental Divide Trail, or CDT, follows (approximately) the Continental Divide and runs from the United States/Mexican border in the south to the Canadian/United States border in the north. Karen is a passionate hiker and has hiked the Appalachian and Pacific Crest trails. Completing the CDT would make her a Triple Crowner, a highly coveted (and rarely achieved) feat in the hiking world. After I offered to take Karen I said to myself why not take a couple weeks off and go birding? My job would end in early April and I could afford to take some time off and have a birding adventure. So I pulled out a map and started thinking and plotting and came up with the following plan: Start by looking for Lesser Prairie-Chickens on the Cimarron National Grasslands in southwestern Kansas. I still needed Lesser Prairie-Chicken for a lifer and Kansas has a blind open to the public on the Cimarron for viewing them. 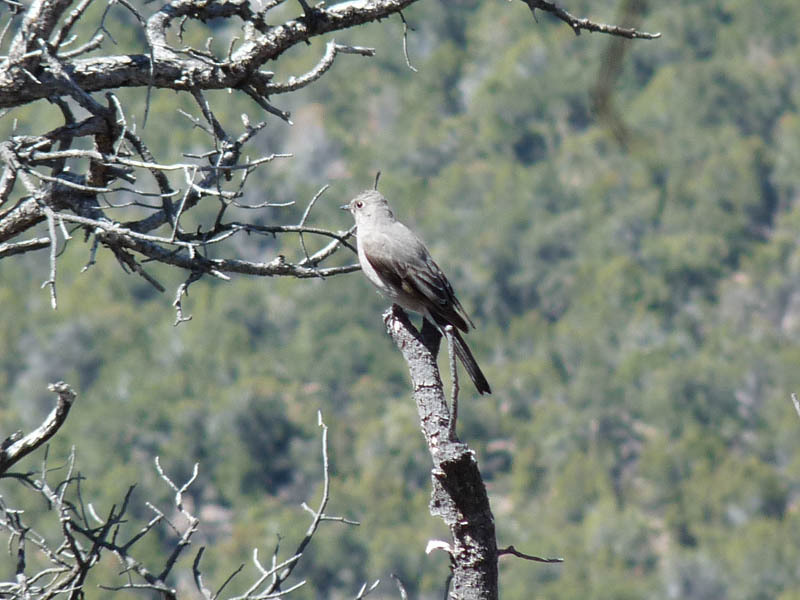 After that, drive to the Gunnison valley in western Colorado to look for Gunnison Sage-Grouse, another lifer. From there drive south through the Colorado and New Mexico Rocky Mountains, then bird along the Rio Grande River in central and southern New Mexico. 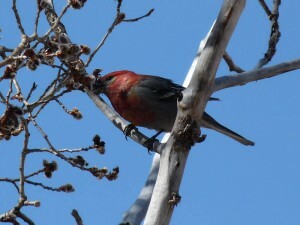 Head west to Arizona and spend a few days hiking and birding the Chiricahuas. After dropping Karen off start back east through Texas, checking Lost Maples State Park, and ending up on the Upper Texas Coast to catch spring migration. Finally, bird the Atchafalaya National Wildlife Refuge in Louisiana. This is an account of my trip. After a long drive from Chicago and a night in Garden City, Kansas, Karen and I woke up early on the morning of Wednesday, April 16 and started out for the Lesser Prairie-Chicken viewing blind outside of Elkhart to, hopefully, view displaying Lesser Prairie-Chickens. This is one of the few blinds on public lands for viewing this species. A few weeks earlier I reached out to a Forest Service official (USDA/Forest Service manages the Cimarron) about looking for the birds there. She told me that 1-3 Lesser Prairie-Chickens were using the lek at the blind outside of Elkhart. One to three didn’t sound like a lot of birds but we only needed to see one bird, and I expected we’d see at least one bird. If ever there was a gimme in the birding world its lekking grouse I thought. Chicagoan and Kansas native Sebastian Patti also gave me the lowdown on looking for the birds, as well as birding the Cimarron in general. The standard protocol for viewing lekking grouse from a blind is to get to the blind before sunrise, keep quiet while in the blind, and wait for the birds to disperse before leaving the blind. We did the first 2 things. When the sun started to come up the dawn chorus of birds of the sand-sage prairie began – Western Meadowlarks, Grasshopper Sparrows, and Vesper Sparrows. A Short-eared Owl also made an appearance. No prairie-chickens though. When the sun broke the horizon, the dawn chorus was going strong but still no sign of any prairie-chickens. Hmm. I thought they would have started up by now. About a half an hour after sunrise we still weren’t seeing any prairie-chickens, so we threw in the towel and left, disappointed and a bit puzzled. Did we get to the blind too late? Did we make too much noise? Did we leave too early? After the dip we drove over to the Forest Service office in Elkhart and talked to a USDA official who told us that 1-3 Lesser Prairie-Chickens were using that particular lek (this must have been the same person I talked to via e-mail a few weeks earlier.) She also told us that the drought had reduced prairie-chicken numbers on the Cimarron, along with other animals, and that the prairie-chickens were starting to abandon this lek for another one. Maybe not seeing the birds wasn’t our fault after all and there were just no Lesser Prairie-Chickens using this lek anymore. Not an auspicious beginning to our trip but this is birding and nothing is guaranteed. After not seeing the prairie-chickens we drove around the Cimarron and explored the Kansas countryside near the Colorado border. Western Meadowlarks, Horned Larks, and Vesper Sparrows were the most common birds. We also had a few singing Cassin’s Sparrows, always nice to hear, and our only Cassin’s Sparrows for the trip. Flocks of noisy Great-tailed Grackles were all around Elkhart. 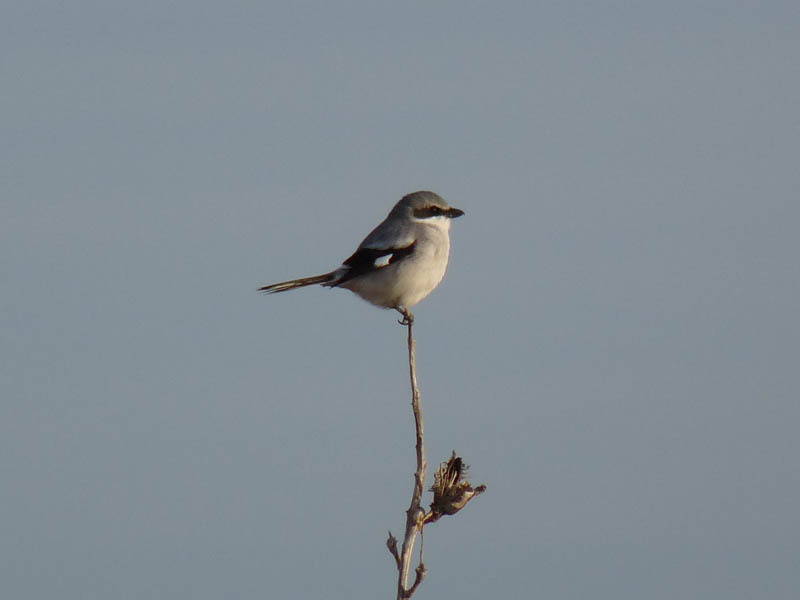 North of the Cimarron River we added Say’s Phoebe, Rock Wren, and a Lark Bunting. Mountain Plovers are supposed to be in the area but we didn’t see any. Near the Colorado border we had a group of 4 or 5 Burrowing Owls in a prairie-dog town. We left Kansas late in the morning and started heading west into Colorado for the next leg of the trip, looking for Gunnison Sage-Grouse. This entry was posted in Non-Montrose Birding on June 23, 2014 by rhughes. Four second calendar year Bonaparte’s Gulls were on the beach inside the protected area at Montrose late this afternoon. Two Semipalmated Plovers were also inside the protected area. The Curve-billed Thrasher continues near the Magic Hedge. 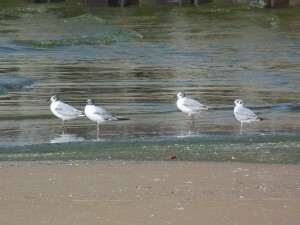 This entry was posted in Summer Bird Reports and tagged Bonaparte's Gull, Gulls, Semipalmated Plover, Shorebirds on June 22, 2014 by rhughes.